Studies confirm what many of us might guess – that a white set of teeth makes people seem more attractive. Three shades were used – a yellowish brown, healthy white, and startling white, which can only be achieved by bleaching. They then showed the photos to 150 young men and women and asked them how attractive they found the models. Unsurprisingly, the yellow teeth were least popular. Teeth can be used to help judge age and health as well as provide clues to childhood illnesses, diet and some genetic disorders. This means that bad teeth suggest other things might be wrong with a person. At Warner Lakes Dental, we want you to make the best possible first impression, which is why we offer you choices to increase the whiteness and shine of your teeth. Inadequate oral hygiene leaves stains, plaque and tartar behind. The longer these remain on the teeth, the harder they are to remove with your toothbrush and floss. Food and drink are major culprits, particularly drinks like coffee, tea, and red wine. Colored foods like blueberries and soy sauce can stain your teeth and play a role in the discoloration. Regularly eating acidic foods can soften protective tooth enamel and allow stains to appear on the teeth. We also need to be careful not to brush immediately after eating anything acidic. Generally, wait 20 to 30 minutes before brushing. Smoking and chewing tobacco can lead to horrendous stains. Nicotine can leave deposits on teeth that lead to discoloration, not to mention the gum disease and bone loss that it causes. Ageing is another cause of yellow teeth. Over time, the enamel on a tooth gets thinner and more translucent, allowing the inner layer of the tooth (the dentin) to show through. This inner layer is more yellow in some peoples’ teeth than others. 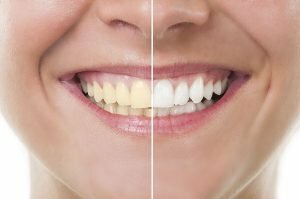 For those people who have yellow teeth and want to do something about it at home, there are plenty of DIY remedies to get rid of yellow teeth, although none of these techniques are as powerful as treatment from your Warner Lakes Dental dentist. 1. Hydrogen Peroxide. Peroxide has mild bleaching capabilities that may help bring the white back to your teeth. 2. Baking Soda. Baking soda has often been used in toothpaste as a cleanser. You can mix baking soda with peroxide solutions, lemon juice, or white vinegar to create a whitening paste to brush your teeth with. 3. Strawberries. Strawberries contain a fair amount of vitamin C, which can help break up plaque. They also carry malic acid, which might be able to help whiten teeth. While DIY cleaning can help, it is nowhere near as safe, efficient, or fast as whitening through your Warner Lakes Dental dentist. Your dentist will provide précised instructions on how to use the trays. Whether you want to whiten your teeth in our clinic or use our custom trays in the comfort of your home, teeth whitening is a safe procedure that can produce dramatic results. Zoom! Teeth Whitening System is a quick way to brighten your smile and boost your self-confidence. If you suffer from severe intrinsic yellowing, we may recommend porcelain veneers. If chipping, grinding, or cavities are the cause of your discolouration, we may recommend a restorative treatment. In any case, we work closely with you to find an appropriate solution for your smile. Affordable teeth whitening in Warner, Warner Lakes, Joyner, Whiteside, Cashmere, Albany Creek, Aspley, Bridgeman Downs, Strathpine, Brendale, Bray Park, Eatons Hill, Griffin, Lawnton, Petrie, North Brisbane and Brisbane. At Warner Lakes Dental, we offer Philips Zoom Teeth Whitening System. Teeth whitening is a safe, non-invasive and simple process that enhances the colour of your teeth and brightens your dull smile. We only use the highest quality of teeth whitening products in a safe manner to ensure that you will achieve the smile of your dreams. Call us your Warner dentist today on (07) 3448 0162 or book your appointment online to schedule your teeth whitening consultation.